How are undergraduates entering the visual arts major prepared for understanding art as a process of analysis and inquiry? How can graduate students, who frequently are the instructor of record in foundations courses, be better prepared for teaching with linguistic tools that develop and refine visual thinking? These two questions guided the discussions at ThinkTank 2. ThinkTank is a yearly forum that discusses the future of foundation art programs and creates focused activities linking educational objectives to learning goals. It has evolved out of the commitment of a national network of art educators, and their respective institutions, who are concerned with undergraduate students' introductory training in the visual arts. With the support of Foundations in Art: Theory & Education (FATE) and the Lamar Dodd School of Art, University of Georgia, ThinkTank 2 brought together 32 individuals for two and a half days to address issues of foundations curriculum involving critical theory, critical thinking, and critique (the 3 C's). Out of these discussions, ThinkTank 2 has produced a primer intended for immediate use by novice foundation teachers. This is a practical guide to thinking about the content of teaching in a foundation program, with specific recommendations for strategies and teaching assignments for incorporating the 3 C's into instruction. It may also be of interest to experienced foundations teachers who would like to reflect on and improve their existing practice. Along with the primer, a complete set of notes and images of notes is available for those who are interested in going deeper into the deliberative process of ThinkTank 2. These materials are available below for download. Besides obtaining information about ThinkTank from this website, we ask that you also return and post your comments about these materials. Were they helpful? How did you use them? What was your experience in the classroom? How would you extend the ideas presented in the primer? In addition, you can use the webpage to learn about upcoming ThinkTank events. ThinkTank's objective is to develop a community of learners, who are committed to robust education in the visual arts. The webpage is the center of this community. We look forward to your participation. Long term, ThinkTank 3 is currently planned for summer 2008 at the School of the Art Institute of Chicago. Ultimately, ThinkTank is working toward the creation of its own Institute for Integrated Teaching in the Arts that mentors new educators in best practices. As the abilities to think imaginatively, analyze visual meaning, and collaborate with others are critical skills to designing the future, the Institute for Integrated Teaching in the Arts would be a cross-disciplinary center with the visual arts, visual thinking, and visual experience at its core. THINKTANK 2 NOTES: CRITICAL THINKING Break-Out Group. ThinkTank II, an initiative of Foundations in Art: Theory and Education (FATE), met May 22-24 at the University of Georgia. Thirty- two higher education professors in foundations and art education attended the invitational workshop. Participants addressed two major issues. 1. How can undergraduates entering the visual arts major be prepared for understanding art as a process of analysis and inquiry? 2. How can the graduate students and adjunct teachers who teach the majority of Foundations courses be better prepared for teaching these core skills? 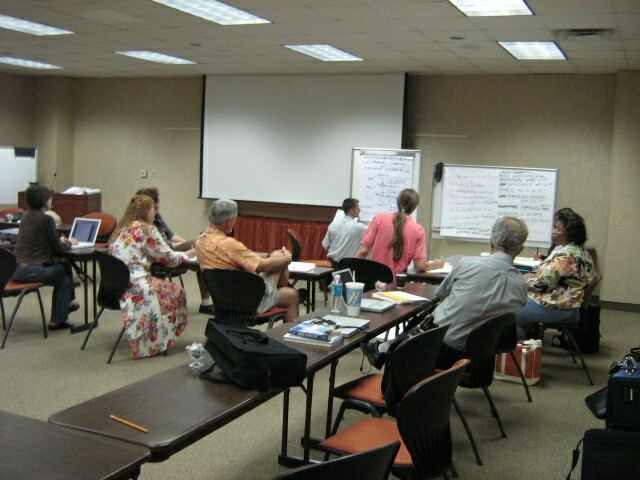 To address these issues, working groups formed around each theme. 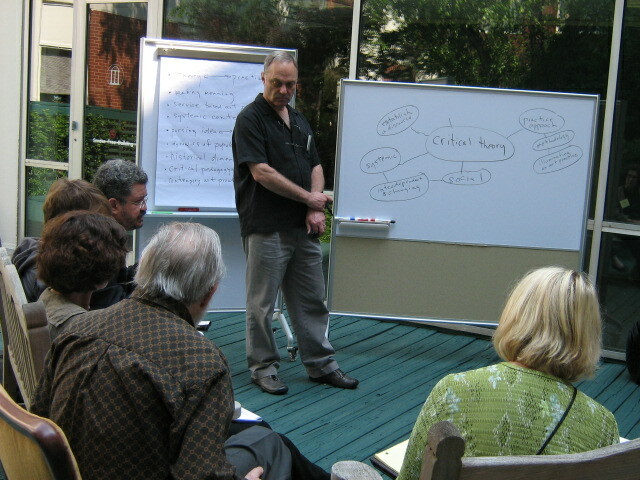 Jim Elniski facilitated Critical Theory. Mary Stewart facilitated Critical Thinking. Carole Henry and Renee Sandell facilitated Critique. Besides developing ideas and approaches for curriculum, each group found that the intellectual skills it identified were by no means proprietary to the visual arts. The habits of mind and forms of analysis developed in each of the 3 C’s are arguably broad general skills for the 21st century workplace. From this point of view, teaching art is more than teaching art. Thus, the potential audience for Foundations courses extends far beyond the visual arts major. Mary Stewart will be posting more detailed notes as they become available, as well as future ThinkTank events. ThinkTank II is a mixture of ThinkTank I attendees and new participants in order to blend last year's experience with emerging content for this year's event. The goal is to focus on Teaching the 3 C's: Critical Theory, Critical Thinking, Critique Strategies through a workshop format. courses, be better prepared for teaching linguistic tools for developing and refining visual thinking?